Jose Mourinho's Real Madrid return was vetoed by Karim Benzema and Sergio Ramos. 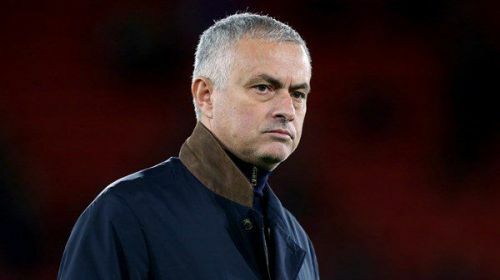 According to the reputed Spanish media outlet, Sport, Real Madrid skipper Sergio Ramos, and Karim Benzema vetoed the return of former manager Jose Mourinho at the Bernabeu. Amidst the sacking of Santiago Solari, Jose Mourinho and Zinedine Zidane were the prime targets to take the Madrid job. However, the latter was eventually announced as the Los Blancos' boss, 284 days after his shocking departure. Zinedine Zidane shockingly announced his resignation following Real Madrid's third successive Champions League triumph during his helm at the Spanish capital. Following a dreadful season in the Frenchman's absence which saw the Galacticos crashing out of the Copa del Rey and the Champions League after already trailing their eternal rivals and leaders FC Barcelona by 12 points in the La Liga, the Madrid hierarchy decided to sack Santiago Solari and pave a path for either of Mourinho or Zidane's return. The Portuguese tactician, who was sacked by Manchester United in December amidst a woeful campaign, was one of the targets to replace Solari. The former Porto boss delivered three titles to Madrid, including a La Liga title, during his three-year-long tenure with the Spanish giants. Mourinho won the La Liga with Los Merengues with a record number of goals scored. However, due to his ego clashes with big names including, Cristiano Ronaldo, Iker Casillas, and Sergio Ramos, in the latter stages of his Real Madrid tenure, the Portuguese tactician couldn't get along with the Galacticos. The same thing happened in the Old Trafford, where the 56-year-old was known to have been in open warfare with French midfielder, Paul Pogba. The report suggests that Sergio Ramos and Karim Benzema blocked Mourinho's return at the Spanish capital and hence, Florentino Perez had to convince Zinedine Zidane to return to the club. Sergio Ramos even delivered an ultimatum that he will leave the club if Mourinho didn't when the Portuguese manager was in charge of the Galacticos. With Zinedine Zidane, who maintained a healthy relationship with his players, back at the club, there's a positive atmosphere within the Real Madrid dressing room. While the Frenchman is targeting the players he wants to sign in summer, he'd look to continue maintaining his laudable record with the Spanish giants, as Real Madrid takes on Celta Vigo, in what is going to be the first match since Zidane's return.